Observation - CATERPILLAR - UK and Ireland. 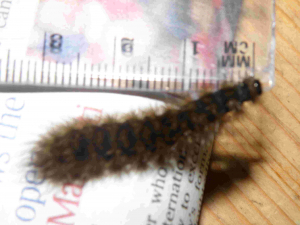 Description: brown caterpillar about 3 - 4 cm long depending on how stretched out it became. I found it in the middle of the road so i have no idea what its foodstuff was. its colouring was both a tan and mid brown with black? hairs over the body. brown caterpillar about 3 - 4 cm long depending on how stretched out it became. I found it in the middle of the road so i have no idea what its foodstuff was. its colouring was both a tan and mid brown with black? hairs over the body.